I've loved Robert McGinnis's covers for a very long time. I remember the first one I was aware of (it was the cover of Ian Fleming's James Bond book DIAMONDS ARE FOREVER, when I was about 9. They put the film poster on the book cover, which puzzled me a bit because the plot of the book isn't the plot of the film.) And I assumed that he had retired a long, long time ago. About a year ago, Jennifer Brehl and I were talking. Jennifer is my editor at William Morrow, and is one of the best, most sensible and wisest people in my life. I am lucky to have her. We were talking about paperbacks, and how publishers put less effort into them these days. I went off about how paperback covers used to be beautiful, and were painted, and told you so much. And how much I missed the covers of the '50s and '60s and '70s, the ones I'd collected and bought back in the dawn of time. And somehow the conversation wound up with me asking if Harper Collins would publish a set of mass market paperbacks of my books with gloriously retro covers and Jennifer saying that yes, they would. A few days later I was in DreamHaven Books in Minneapolis. I noticed a particularly gorgeous cover on an old book on a shelf. "Who did that?" I asked Greg Ketter. I was surprised at how recent the book was. It had been published a few months earlier. "Oh yes," said Greg. "Bob's still painting. Must be almost 90." I sent a note to Jennifer asking if there was even the slightest possibility that Mr McGinnis would be interested in painting the covers for the paperback set we wanted to do. He said yes. I say that so blithely. 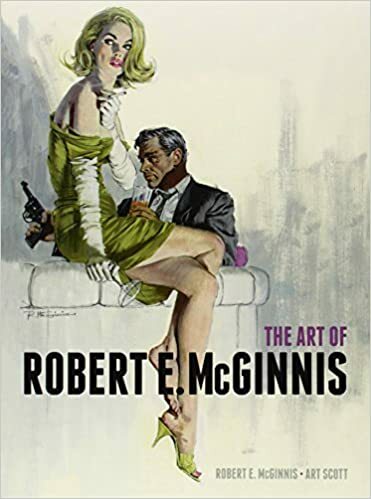 But he has retired, pretty much, and he doesn't have email, and it was only because the Morrow art director had worked with him, and he was intrigued by the commission... and ROBERT MCGINNIS SAID YES. He sent in the first painting, the one for American Gods. It was perfect. Now we needed to make everything that wasn't the cover feel right. Todd Klein, the finest letterer in comics, came in to create each book's logo and to help design it and pick the fonts, to make each book feel like it came from a certain age. Each painting from McGinnis was better than the one before. Each Logo and layout from Todd Klein was more assured and more accurate. These things are glorious. Now... we were planning to announce these in an much more planned and orderly way. I'm not going to tell you what books we're doing, or to show you any covers but the one. 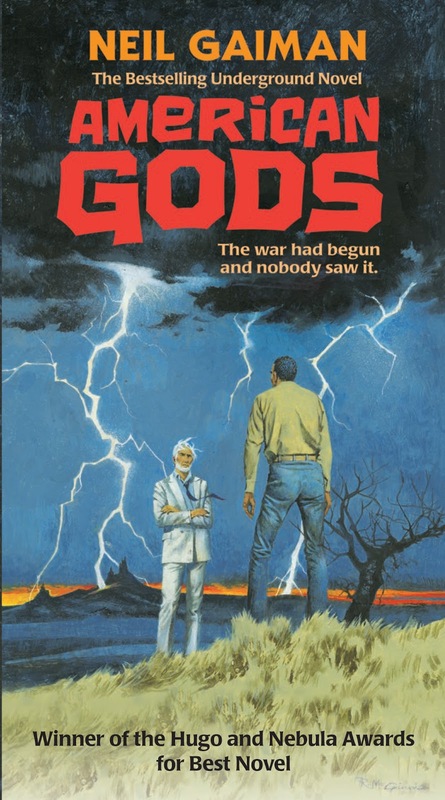 And that's because the upcoming 2017 Starz American Gods TV series has created a huge demand for copies of American Gods. People who have never read it have started buying it to find out what the fuss is about. People who read it long ago and gave away their copy bought new ones to reread it. So they've rushed back to press with the new paperback edition, which wasn't meant to be coming out for some months (and the text is the text of the Author's Preferred edition in case you were wondering). And that means the version of the paperback with the new cover is going to be coming out a lot sooner than we thought. And tomorrow it will probably up on Amazon. And I wanted you to hear it from me first. You aren't going to see the rest of the Robert E McGinnis covers for a little while (and each of them looks like a different kind of book from a different era). But this is the first of them. ...and wait until you see the rest of them.